Event-specific circumstances, sometimes, create interesting situations for deploying capital. The Indian Natural Gas sector presented one such instance; in Equities and Implied Volatility, this week. IVs popped across the board, principally manifesting in Indraprastha Gas (Bloomberg: IGL IN, NSE: IGL), which was the chief victim in the melee. Reacting to the adverse regulatory pronouncement, other companies in the Natural Gas space too came under fire from investors, IVs spiked as stock prices swooned. IGL stock fell over 40% within minutes and other companies shed double digit percent. Petronet LNG (Bloomberg: PLNG IN, NSE: PETRONET), however, should have escaped relatively unscathed, as the ruling is expected to have little impact on its earnings power. But fear is a pervasive force, which divorces with rationality in time of duress. Time eventually acts as an arbiter in the estrangement but the process is gradual and fraught with roadblocks. Panic-induced selling traces a typical cycle. An event acts as a stimulus, triggering ripple reactions (and over-reactions) in several directions. The magnitude and length of time of the selling is contingent on the gravity and expected persistence of the negative information. Once the initial wave of selling abates, traces of value can often be found in several pockets. The PNGRB ruling was directed towards gas transportation and compression operations. Regasified LNG, PETRONET's core business, did not fall under the purview of the regulator. To this extent, PETRONET's earnings power was insulated against the adverse regulatory development. The stock, however, shed about 12% minutes after the stimulus triggered widespread selling. 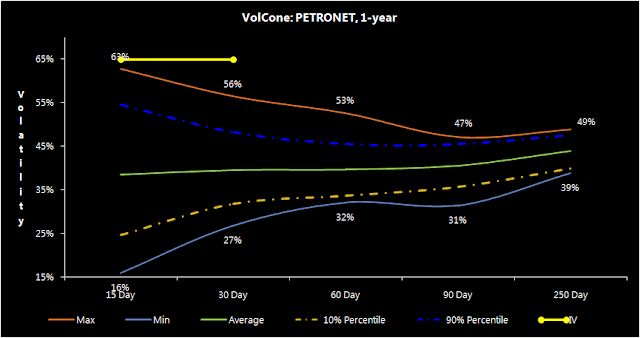 The magnitude of correction was overdone, taking PETRONET's valuation to levels (sub-10x P/E, 5-year historical P/E = 14x), which offered an attractive value proposition for long-term oriented investors. PETRONET's per share earnings have grown at over 30% annually over 2006-Dec 2011. Turning to India's natural gas fundamentals, the favourable demand-supply gap is unlikely to reverse in the near future. The natural gas deficit situation is likely to persist over the medium-term and PETRONET is likely to realise above-average prospective growth in per share earnings. As market participants absorbed the impact of the regulatory development, Longs moved in to PETRONET and the stock recovered most of its losses by the close of the day. IVs had been hovering in the early 30s in late-march/early-April. The event stimulus resulted in PETRONET IVs popping across the board, with strong skew emergence as participants scrambled to buy downside protection. IVs increased to rich levels relative to history and Short Volatility postures offered attractive risk-reward. 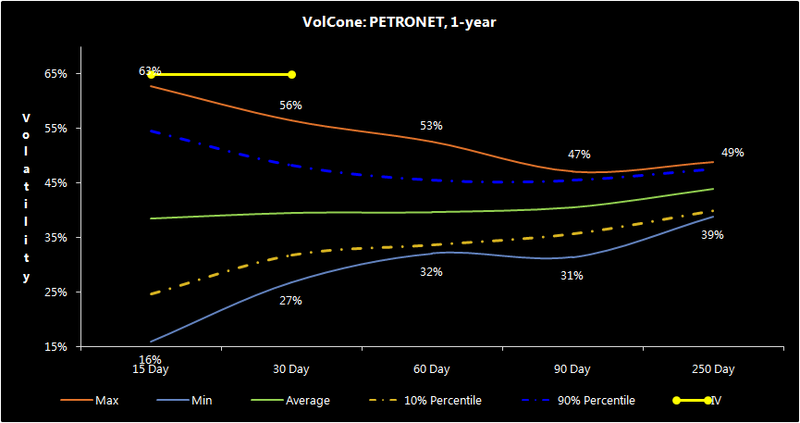 The following chart captures the evolution of Implied Volatility and PETRONET Put Option Greeks, across strikes, in the few days post-event. As normalcy returns gradually, IV and Vega (sensitivity of Option prices to changes in Volatility) are gradually drifting lower. For an option insurer, shorting Volatility at higher-than-normal levels improves risk-reward materially, offering a reasonable margin-of-safety. Subsequent IV compression leads to value realisation. The compression is most prominent in close-to-money strikes, with deep OTM strikes exhibiting lower sensitivity but working wonderfully, nonetheless. Classic value emergence across the equity piece in the capital structure and in volatility, a less-widely viewed asset class. Disclosure: Expressed & unwound profitable Short Volatility positions. Continue to hold certain positions, as of this writing. Disclaimer: This is not a solicitation to buy/sell any instrument discussed here. Views are contingent on future circumstances and may change without notice. There is immense risk of loss in Options investing. Please consult your adviser, and more importantly your judgement, before making investment decisions.